An anti-aging eye cream formulated with red ginseng that helps minimize the look of wrinkles and improves the visible appearance of firmness for youthful-looking eyes. The active anti-aging substances derived from red ginseng provide intensive care for the visible loss of firmness and elasticity around the eyes, as well as deep-rooted wrinkles and fine lines. 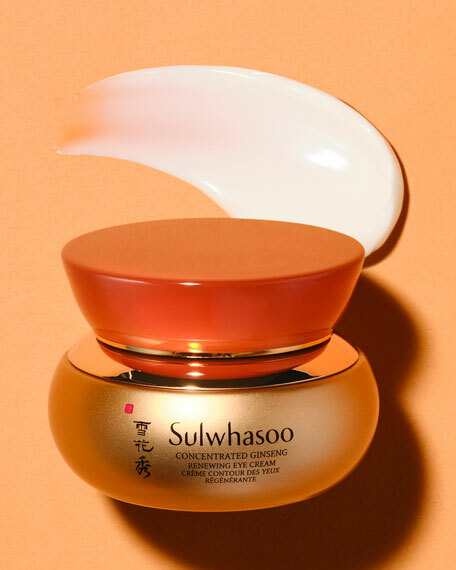 It contains ginseng roots and flowers optimized in anti-aging benefits through Sulwhasoo's own comprehensive ginseng research of over 50 years. The viscous, luxurious texture of the eye cream provides intense moisture and gently wraps the skin around the eyes, leaving a smooth, residue-free finish. Dispense an appropriate amount of the eye cream on the fingertips and lightly dot under the eyes. Use the ring finger to pat the cream on the skin using small, circular strokes. Using the ring finger, lift the skin around the eyes upwards and smooth out the cream around the orbital bone. With any remaining cream, finish by gently applying the eye cream to the middle of the forehead in an upward direction. Apply morning and evening, after applying Serum. 37 Actives High Performance Anti-Aging Cream, 1.7 oz. La Prairie Cellular Cream Platinum Rare, 1.7 oz.